Virgin coconut oil is sometimes described as having incredible and near-miraculous health benefits as a nutritional supplement. Some of these exaggerated claims are made by manufacturers or by websites that sell the coconut oil which is clearly a conflict of interest. Does coconut oil have any real benefits for health? Coconut oil is extracted from the meat of mature coconuts harvested from the coconut palm. There are several methods for extracting the oil and they produce oils with different characteristics. In the traditional method, the coconut kernel is shredded, mixed with a little water, and then squeezed to extract an emulsion called coconut cream or coconut milk. The coconut milk is then allowed to separate naturally, and the oil rises to the surface. In the dry process, shredded coconut is dried in the sun or in an oven and the oil is extracted by pressing. The dried coconut kernel is called "copra", and coconut oil is sometimes called copra oil. 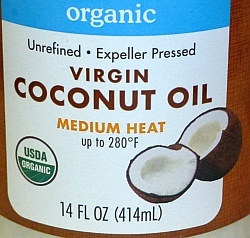 Virgin coconut oil is defined as coconut oil obtained by mechanical or natural means with or without the application of heat, which does not lead to alteration of the oil. Coconut oil prepared by cold pressing preserves polyphenols and other biologically active components that may be degraded by heat. Coconut oil is used in foods, medicines, cosmetics, and industrial applications. In some Asian countries, coconut oil is used for cooking and frying, and coconut milk is used as an ingredient in curry recipes. Coconut oil is resistant to rancidity and its use increased as a replacement for hydrogenated fats when manufacturers were required to report trans fats in nutrition labels. Chemically, coconut oil is a mixture of triglycerides (compounds made of glycerol and fatty acids) with carbon chains of 8 to 18 atoms. Over ninety percent of the fatty acids in coconut oil are saturated, which means that they cannot oxidize and become rancid. Approximately 60% of coconut oil consists of medium-chain triglycerides (MCTs) with fatty acids of 6 to 12 carbon atoms. The only unsaturated fatty acids in coconut oil are oleic acid and linoleic acid which comprise only 8 percent of the total fatty acids. The typical fatty acid composition of coconut oil is given in the following table. The health claims for coconut oil are based on the properties of some of the fatty acid components. Medium-chain triglycerides are absorbed directly from the gastrointestinal system and consumption of MCTs has been shown to increase energy expenditure and lead to greater losses of the adipose tissue in animals and humans. Lauric acid is also found in human milk (6.2% of total fat) and it has antibacterial and antiviral activity[2,3]. Something that is less frequently mentioned about coconut oil is that its high content of myristic acid increases cholesterol strongly and the palmitic acid also increases cholesterol. [4,5] Even though coconut oil itself does not contain cholesterol because it is a vegetable product, its fatty acids produce a significant cholesterolemic response in the body. One tablespoon of coconut oil (about 14 grams) provides 13.2 grams of saturated fat which is 65% of the Recommended Daily Allowance. This makes it difficult to add other sources of healthier dietary fats without exceeding the saturated fat allowance. Unfortunately, it is not possible to separate the fatty acids with potential beneficial effects from the ones that increase cholesterol. Coconut oil may not be a good dietary fat, but when used as a skin moisturizer, it is as effective and safe as mineral oil. In addition, applied topically as a cream or lotion, coconut oil has antimicrobial properties against yeast infections such as Candida, and antifungal properties against Trichophyton which is the fungus that causes tinea fungal infections like ringworm, athlete's foot and jock itch. The antifungal properties of coconut oil may be due to its content of medium chain fatty acids such as capric acid. M-P. St-Onge, P.J.H. Jones, "Greater rise in fat oxidation with medium-chain triglyceride consumption relative to long-chain triglyceride is associated with lower initial body weight and greater loss of subcutaneous adipose tissue", International Journal of Obesity 27: 1565–1571 (2003). Hegsted DM, McGandy RB, Myers ML, Stare FJ, Quantitative effects of dietary fat on serum cholesterol in man. Am J Clin Nutr. 1965 Nov; 17(5):281-95. Martijti B Katan, Peter L Zock, and Ronald P Mensink, Effects of fats and fatty acids on blood lipids in humans: an overview, Am J Cli. Nutr., 1994;60(suppl):1017S-1022S. Agero AL, Verallo-Rowell VM (September 2004). "A randomized double-blind controlled trial comparing extra virgin coconut oil with mineral oil as a moisturizer for mild to moderate xerosis". Dermatitis 15 (3): 109–16. PMID 15724344. Ogbolu DO, Oni AA, Daini OA, Oloko AP., In vitro antimicrobial properties of coconut oil on Candida species in Ibadan, Nigeria, J Med Food. 2007 Jun;10(2):384-7. Garg AP, Müller J., Inhibition of growth of dermatophytes by Indian hair oils, Mycoses. 1992 Nov-Dec;35(11-12):363-9. Chadeganipour M, Haims A., Antifungal activities of pelargonic and capric acid on Microsporum gypseum, Mycoses. 2001 May;44(3-4):109-12.